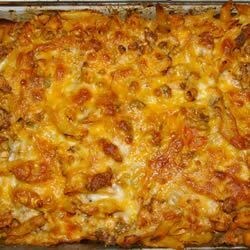 "Not a recipe for people on a diet - chicken, sausage, and penne is baked in a creamy tomato sauce. I cook the meats, pasta, and sauce all at the same time, but it can be done individually and refrigerated before baking it in the oven." Heat the oil in a large deep skillet over medium-high heat. Add chicken, and cook until firm and lightly browned, about 5 minutes. Stir in the bell pepper and chorizo and cook for 5 minutes until the chorizo is hot and the chicken is no longer pink in the center. Remove from heat. Pour the tomato puree, cream, and red pepper flakes into a small saucepan. Bring to a simmer over medium-high heat, then reduce heat to medium-low, and simmer 5 minutes until the sauce has thickened. Add drained pasta and sauce to the skillet containing the chicken and mix well. Spoon the mixture into an oven proof dish. Sprinkle the Cheddar, mozzarella, and Parmesan cheese over the top. Bake 30 minutes, or until the top is golden and bubbly. A tasty recipe that makes great leftovers. I used milk instead of the heavy cream to lighten it up a bit. Nice flavor and easy to make. This was a good pasta dish. I would cook the chicken a little less than instructed because we thought the chicken was dry. I used vegetarian chorizo and milk instead of light cream. Fantastic! I thought this was pretty good. I think next time I will use less chicken and more chorizo. It wasn't really spicy and I felt the chicken was pretty bland. All in all not a bad dish. My husband and kids really enjoyed this hearty dish. Great for using up left over chicken/chorizo.